It’s been a little over a month since the New Jersey Marathon, and I am still having trouble wiping the grin off my face whenever someone asks me how I did. Even though the story of my success in that race is more mundane than the story of my failure in Toronto, I don’t think I’ll ever tire of telling it. At work, I have now become “The Running Guy.” People stop into my office from time to time to ask advice on training, sneakers, nutrition and all sorts of other running issues. Whether I believe it or not, other people now identify me as a runner. After a week off, I began a very gentle couple of weeks easing myself back into the swing of things. 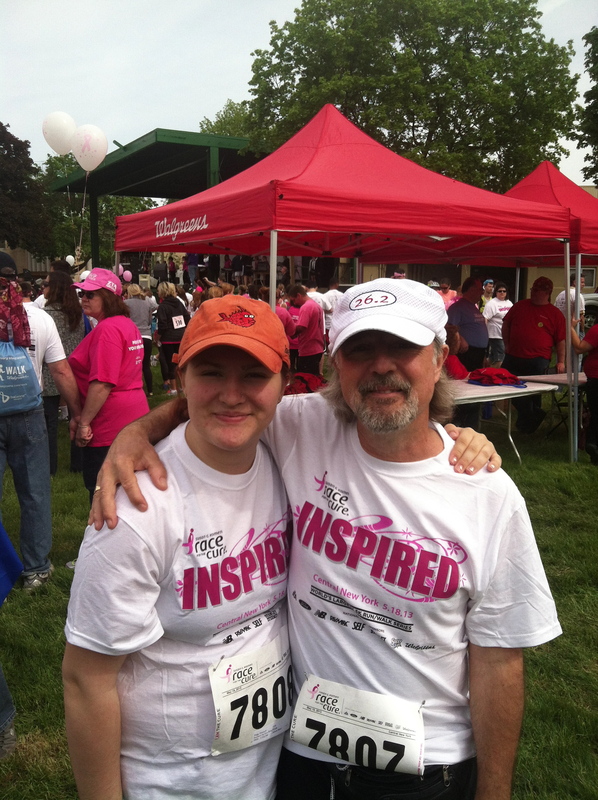 The highlight of those 2 weeks was running the Susan G. Koman Race for the Cure with my daughter Hannah. She had been coming to the gym with me whenever she could while I was training for New Jersey, and I had finally managed to talk her into running her first race, a noncompetitive 5K with several work colleagues. The plan was to run as a group, with me running at their pace. Almost immediately, however, Hannah managed to find a very nice, gentle pace that was too fast for the others. Once we broke clear of the huge group of walkers that were all around us, Hannah and I set off on our own, and for the next 40 minutes I enjoyed a wonderful daughter/dad memory with her. When she crossed the finish line and realized that she had exceeded her expectations, I saw the look of achievement on her face and could not have been more proud. Hannah and Dad at the Susan G. Koman Race for the Cure. State Fairgrounds, Syracuse NY. May 18, 2013. After another week of gentle running, it was time to get back to business. I didn’t want to jump into the Hanson’s program immediately, even though the Rochester Marathon was now 18 weeks away, as I wanted to prepare for the next race on my schedule: tThe Boilermaker. I spent an evening with a calendar and the Hanson’s book trying to design an interim program that would (1) incorporate the interval/strength and tempo runs of the Hanson’s program, (2) prepare me for an ambitious 1:24 PB at the Boilermaker, (3) not be so mileage-heavy that it would impair my Boilermaker performance and (4) be able to dovetail perfectly into week nine of the Hanson’s training for Rochester. It’s not perfect by any means: for a start, the week after the Boilermaker I have to make a huge mileage leap to 47 miles. But the interval/strength and tempo runs match up pretty well, and in the end, the total mileage will be about the same as New Jersey, which is the ultimate goal. After two weeks of training, things are looking good. I am adding in some hill training, preparing for the Golf Course hill at 3-1/2 miles, and already the tempo and interval runs are yielding some good, fast times. But, as always, the only time that matters is the time on race day. This entry was posted in The Flat-Footed Fox and tagged Hanson's Marathon Training, long-distance running, New Jersey marathon, Susan G. Koman Race for the Cure, Toronto Waterfront Marathon, Utica Boilermaker. Bookmark the permalink.